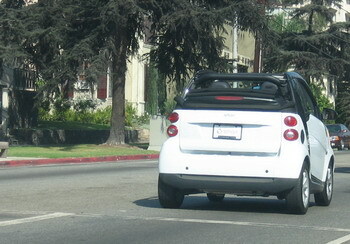 This is the second Smart I have seen in our neighborhood within one week. Two minutes later a Mini Cooper passed by. 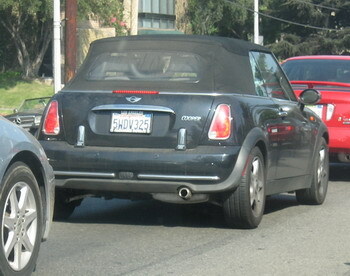 The next 2 1/2 hours I spent counting Mini Coopers. The total came to 10. This ties in with what I have noticed for months now: parking lots, especially at supermarkets, used to be filled with big bad cars – Explorers, Tahoes, Hummers, trucks large enough to transport whole households from one coasts to the other. Oftentimes I also saw the drivers of those big boats – women, obviously very pleased with the fact that they did not have to squish their three bags of groceries into a tiny car. I, on the other hand, was very often not pleased with the fact that said ladies, after having climbed on board, did seem to have some difficulties to navigate their whopping huge heaps of metal off the parking lot. Today the big boats are gone. Where are they? Have they all been shipped off to some secret island, where they stand under a palm tree, dreaming of those days when gas was cheap and they could proudly display themselves on parking lots in between runs to the school two blocks away to drop off Junior or the little Princess? They’ve probably all been shipped to South America or China where no one cares how much gas they use apparently. Next PostNext That's For Real, Man!